Short review: "The Urban Masterplanning Handbook"
Adhering to the naming convention of the ongoing family of ‘urban handbooks’ from Wiley, this substantial book is less a instruction manual for urban development and more a deep resource of use to architects, urban designers, planners and other development professionals. 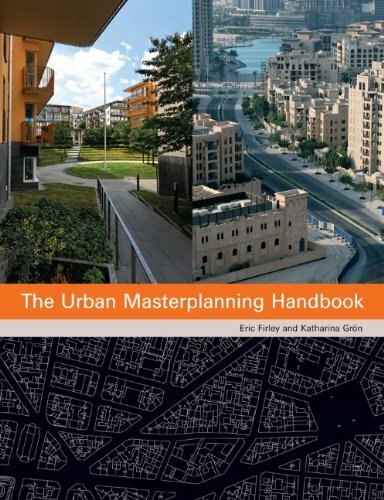 Starting with a succinct summary of the evolution of masterplanning, the authors offer their own definition which is clear, concise and characteristic of the supporting text and images evident throughout the book. Setting out to assess “how much control is desirable and necessary for urban development”, the bulk of the book is devoted to 20 case studies of historic and more recent masterplans drawn from around the world. These case studies explore the many possible approaches to urban development with the acknowledgment that the selected projects are not necessarily best practice, nor presented as a universal process to be followed step-by-step. The authors compare them both visually and organisationally and in doing so, draw out those approaches which were most effectively utilised in each situation. The case studies themselves are crisply written, yet still convey a considerable amount of detail. Each masterplan is set in its physical, political and historic context and the key processes which influenced the final urban form are explained. Details of early evolution of the respective approaches, including the establishment of economic structures, development vehicles and in some cases profit share mechanisms, offer fascinating insights into how whole new sections of cities were funded and delivered. Similarly, it is particularly illuminating to observe through both text and diagrams how land ownership was transformed during development in each case; public/private relationships are one of several layers of analysis which are uniformly presented for comparative purposes. The diagrams themselves are sharp and consistent with the methodical tone of the book, but in places would benefit from annotation for those not familiar with the area or the specific urban components referenced in the accompanying text. The illustrative material can be a little clinical and lacks some of the untidiness of the creative/testing process which can add to the diversity of the end result. The strongest theme running through the book, however, are the explanations of the political mechanisms and financial functions which made construction viable; what is apparent is the critical need for both a strong overview to be taken and the vision to drive through what are inherently long-term goals. At this time of continuing economic uncertainty, it is unfortunately rare to see such persistent forces at work across our suffering urban areas. This mini review was originally published on the bdonline.co.uk Book Club. The link above is an affiliate link and sales through this link may benefit this site.